However, the Dublin-based company has said that there will be no disruption to flights. PILOTS AT DUBLIN-BASED CityJet have announced their intention to strike and vowed to ground the airline before Christmas. However, the company claims that there will be no disruption to flights. The Unite trade union said today that 82% of pilots represented by the union voted to escalate the limited industrial action commenced in September. In a statement, Unite claimed that the vote followed CityJet’s “refusal to allow the WRC (Workplace Relations Commission) to refer the issues in dispute to the Labour Court”. Unite regional officer Willie Quigley said that the resolution to the dispute “is in CityJet’s hands”. “If they want to avoid being grounded before Christmas, they must agree to our dispute being referred to the Labour Court, and withdraw their threat to terminate the agreement between Unite and the company,” he said. 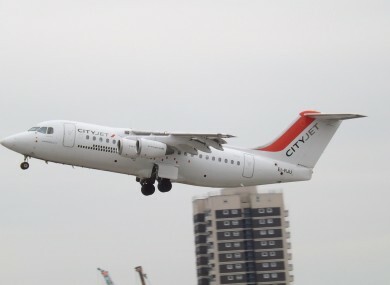 However, a statement from CityJet said that the company “anticipates no disruptions to its flights between Dublin and London City Airport in the lead up to Christmas” following the decision of pilots based in Dublin to threaten industrial action. “The threat of industrial action from members of the Unite trade only involved a small minority of pilots. The airline employs 80 pilots at its Dublin base, with the minority being affiliated to the trade union,” the statement said. A Unite spokesman told Fora that the union represents 40 pilots. The union spokesman confirmed that no strike dates have been set yet. Quigley claimed that in addition to “ongoing pay issues and a refusal to allow the WRC to refer those issues to the Labour Court, the company is compounding that refusal by threatening to terminate their agreement with Unite in respect of pilot representation”. This is a denial of our members’ right to collective representation by the union of their choice. Quigley said that other issues in dispute include “CityJet’s refusal to adequately compensate pilots who are being moved to the Amsterdam base to the imposition of ‘bond payments’ to secure a job with the company”. Email “CityJet pilots vote for strike and warn they will ground airline before Christmas”. Feedback on “CityJet pilots vote for strike and warn they will ground airline before Christmas”.